The ER10,000 is the largest tank we manufacture. It is ideally suited to rural properties relying on tank water or for use on the farm. The inlet comes fitted with a leaf strainer at the 12 o'clock position. 2x 25mm brass outlets are moulded into the tank at 3 o'clock and 9 o'clock positions at ankle height. 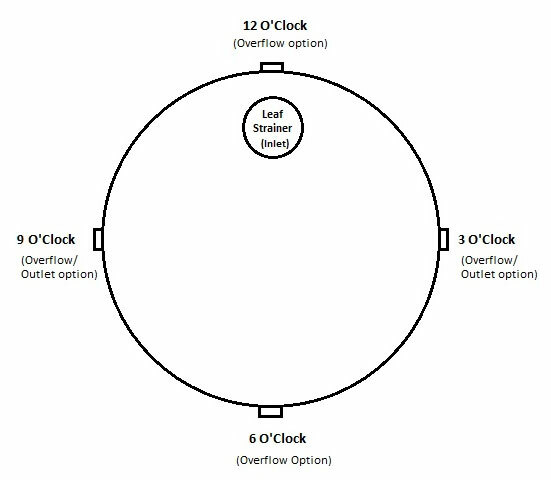 Overflows are moulded into the tank at 12, 3, 6 and 9 o'clock positions. **Outlets and overflows are sealed however can be drilled out upon request at time of order (see diagram on tab) or by using a holesaw. Included with your tank purchase is a 25mm ball valve, leaf strainer (fitted) and 90mm overflow flange and mozzie stoppa (not fitted). Joining two or more tanks together is easy with the use of flexible coupling (made to suit your required length, price on application) and an additonal 25mm ball valve ($25) to connect to a pump. *Please note due to increases in production costs, all round tanks have increased by $20 as of 1 April 2019. Have a colour preference? Tanks are made to order, choose from over 25 colours! Returns for incorrect size or colour are not accepted. Need a pump? Refer to our range of submersible and external pumps suited to garden use, granny flats or whole house use. Got a question? Give us a call 1300 73 72 10, Mon-Fri 7.30am-4.30pm. We are happy to answer your questions and can take orders over the phone! All Enviro Water Tanks are made with 100% Polyethylene food grade material and come with a 20 year warranty (see warranty and installation/ site preparation guide). You have the option of the 90mm Overflow being drilled out at 12, 3,6 or 9 O'Clock. The Enviro Water Tanks warranty will be for a period of 20 years subject to the conditions herein as specified. Enviro Water Tanks guarantees that its tanks are free of defects from any faulty manufacturing and that all its tanks are approved by a certified structural engineer for a minimum tensile strength at yield of the material at 18mpa at a service temperature of 23 degrees Celsius. 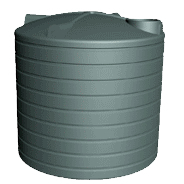 Enviro Water Tanks warrants its Polyethylene tanks will perform the function for which they are designed for, namely to hold potable water at ambient rainwater temperature. The warranty will start from the date of purchase. The original receipt must be kept as proof of purchase to validate the warranty. The warranty is not transferable. Should the tank fail to perform its function for which it is made due to a manufacturing fault during the 20 year warranty period, Enviro Water Tanks at its discretion may repair or replace the tank at no cost to the customer. This warranty will be null and void if damage is caused by acts of God such as floods, earthquakes, landslides, ozone depletion or natural disasters. The purchaser is responsible to secure the tank so that the tank cannot move or fall over whether the tank is empty or contains water. Enviro Water Tanks accepts no responsibility for any damage or injury caused by a tank that has not been secured properly. The warranty is void if any person has walked on or placed any weight or load to the top of the tank. Enviro Water Tanks retains ownership of all goods sold until full payment has been made by the purchaser. Any defect or fault that has been brought to the attention of the purchaser prior to purchase will not be covered under this warranty. Once goods have been delivered to the site the purchaser is responsible for any damage or theft that may occur. Over an extended period of time degradation or weathering may occur and the effects thereof are expected by current industry standards so are not covered by this warranty. - The tank is not installed in accordance with the company's installation procedures. - The tank has been subjected to any form of misuse or any form of willful or accidental damage. - The tank has been used for any other means than the collection of potable water. The purchaser is responsible for which (product) tank they choose and for suitability of the purpose they wish to use it for. This warranty does not apply where the purchaser installs or uses a tank for a purpose for which it was not fit. Where any provisions of this warranty are inconsistent with the provisions of any statute, rule or regulation under the common law, that provision shall be treated as excised only to the extent of the inconsistency and leaving in so far as possible the balance of the provisions of this warranty unaffected. All liabilities, conditions, warranties and obligations of any kind (other than outlined in condition number 10) which are or may be imposed or implied to the contrary by any statute, rule or regulation, or under the common law and whether arising from the negligence of the company, its employees or otherwise are hereby excluded except to the extent that the company may be prevented from doing so by any statute, rule or regulation under the common law. All water tanks must be installed in a professional manner and in accordance with Enviro Water Tanks installation and site preparations otherwise the warranty will be null and void. The Purchaser is responsible to return goods (water tank) to the original place of purchase for any issue related to warranty so EWT can determine whether it is a warranty claim, and is so can repair or replace, the product (water tank) EWT will return the product to (water Tank) to the original place of purchase or retailer from where the purchaser if able to collect their goods (water tank) from. All outlets are provided with a water tight brass fittings. There is no warranty on fittings that leak. It is the customers responsibility to make sure that the ball valves are not over tightened or brass outlets are not used to lift tanks. EWT does not provide warranty for ball valves or overflow fittings. Ensure that the area chosen is stable original ground and not filling soil. All Enviro Water Tanks tanks must be on a level base of concrete 100mm thick with a minimum strength 25m.p.a. and one layer of F72 reinforcement. Concrete must extend a minimum of 30mm outside of the tank perimeter of the tank. Crusher dust may be used but must be a minimum of 75 mm thick, compacted and the outside edge must extend a minimum of 30mm outside of the tank's perimeter with edges concreted so the tank cannot be undermined. All tanks come complete with a ball valve, stainless steel mesh strainer and a tank overflow fitting. Enviro Water Tanks recommends a professional tank installer or plumber should install your tank. Polyethylene tanks will expand when filled. Allowance for expansion is required when plumbing work is carried out. Clean leaves & debris from strainer on a regular basis. NB: we do not return tanks for incorrect size or colour.